While PlanesTV.com produce a number of event specific productions throughout the year, their annual end of year treat is the “British Airshows” compilation. This year, it was just released in time for Christmas and I have to say I was very impressed to receive a copy on Christmas Eve despite only ordering on the 23rd December – Well done to the Planes TV office staff and Royal Mail! 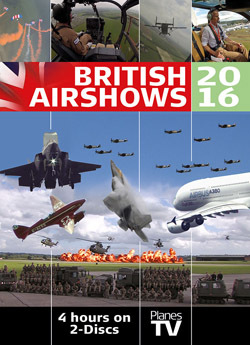 The 2016 edition of British Airshows sees coverage from 11 events which include Duxford’s American and Meet the Fighters Air Shows, Torbay Airshow, RAF Cosford Air Show, RNAS Yeovilton Air Day, the Royal International Air Tattoo, Farnborough International Airshow, Airbourne: Eastbourne International Airshow, Little Gransden Air and Car Show, the Scottish International Airshow and also some footage of a Red Arrows display at Sidmouth. Both the DVD and Blu-Ray editions are split into two discs, each of two hours duration. The main feature is on disc one covering all the shows in chronological order. As in previous years, Sean Maffett provides the introduction, some links between shows and some closing thoughts. Much of the main commentary is taken from live recordings of the actual event commentary from the likes of Ben Dunnell, George Bacon and Brendan O’Brien. For the most part this works well enough though there are a few occasions where the editing of the commentary begins to lose coherence as it doesn’t quite match what is taking place on-screen – a good example of that is the Spitfire tailchase sequence from Duxford’s Meet the Fighters show which is a shame as it comes right at the end of the main feature. Even though just 11 events are covered, it does mean it can be a squeeze fitting in the highlights from some of the bigger events. Certainly the likes of Yeovilton, RIAT and Farnborough provide Planes TV a big problem in terms of what to cover as they provide so many different must-see displays. Certainly at times, you do feel certain big ticket displays from these bigger events deserve more coverage and some of most interesting displays have been missed out. If you are desperate to see a specific display from a certain event, then buy the specific event DVD! That said there is some good coverage of the F-35’s UK debut with plenty of footage from the RAF/USMC displays and the USAF Heritage Flight. It is great to see aircrew interviews back as part of Planes TV’s coverage providing some very good background and story to the airshows and individual displays. They are also nicely mixed with display flying footage too so they do not take away from the excellent filming of the displays. Disc 2 is slightly different from previous years. It still contains extended footage from mini-cams mounted on various display aircraft, some of which weren’t included in Disc 1’s footage. However, there is now no need to use an “Angle” button to access in-cockpit views as the footage had been mixed by PlanesTV. This is a good thing as the Angle button has slowly started to disappear in more modern Blu-Ray players as it never really caught on with mainstream productions and movies. Disc 2 also has four 60 second highlights packages included from the Duxford American Air Show, RNAS Yeovilton International Air Day, The Royal International Air Tattoo and Airboure: Eastbourne International Airshow. 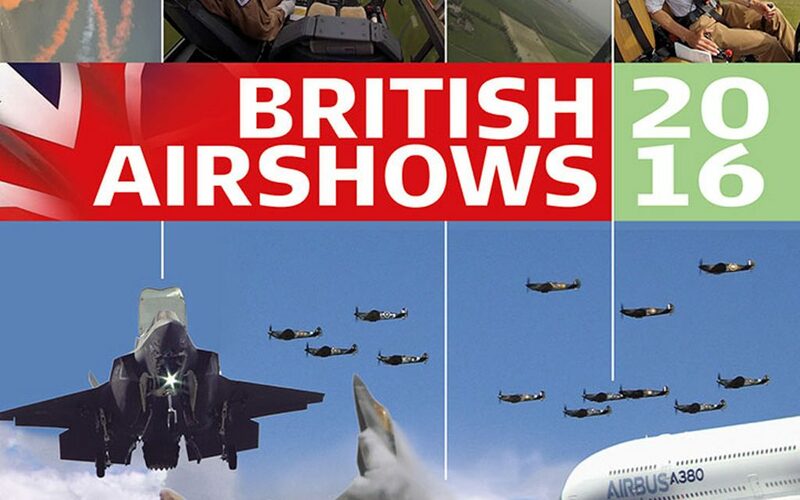 As PlanesTV mention in their blurb and in the intro to the main feature, British Airshows 2016 is a compilation of the airshows they covered (with the exception of Little Gransden) with their live broadcasts. It is not quite the overall round-up of the display season previous editions of “British Airshows” have been and it is a shame that events such as Flying Legends and some of the bigger seaside events such as Sunderland and Bournemouth are no longer covered. That said with PlanesTV’s excellent videography of many different displays this is still a must-have title for any airshow enthusiast looking to see the wide range of different flying displays.